There's something really special about a movie that, with its final moments, makes you re-think everything that's come before it. Sometimes it feels like cheating, the "it was all a dream" movie endings are more infuriating than almost anything you can throw on a screen, but when done effectively, it can be a great point of discussion. Such is the case with The Last Will and Testament of Rosalind Leigh. The feature film debut of Rue Morgue head honcho Rodrigo Gudino, the movie comes a few years after his festival run with a trio of hugely successful short films. With those, Gudino quickly established himself not only as a horror tastemaker but also as a talented storyteller to watch. The Last Will further cements that notion, delivering a successful, well controlled story that is part haunted house and part religious thriller, not to mention a creepy family drama. Aaron Poole stars as Leon, an antiques collector who returns home after his estranged mother's death and discovers that the house has been turned into a sort of shrine dedicated to a mysterious religious cult who appears to have a fascination with angles and statues of religious figures, particularly the Virgin Mary. As if walking into a room chalk full of lifeless eyes staring you down isn't uncomfortable enough, Leon soon begins to suspect that his mother's spirit is lingering and that it wants something of him though what it wants remains a mystery. It's an interesting story that has overtones of religious thrillers but where in others fail by infusing ridiculous CG creatures and jump scares, Gudino chooses to keep this small and intimate. He puts great faith on Poole and the house, itself a staggeringly oppressive character, with great results. As The Last Will progresses, the house feels like it's closing in on Leon, bearing down on him and eventually, the oppressive surroundings have him seeing and hearing things that may or may not be there. The house is spectacular, crowded with artefacts each of which is creepier than the last. The overcrowding is claustrophobic which works wonders to immediately set mood but it helps that Gudino knows exactly how to manoeuvre the camera to achieve the greatest amount of unease, moving in and out of the small spaces, down hallways and through rooms with purpose. It's a great way to build tension and even when nothing is jumping up or creeping into the frame, there's a sense of intensity that permeates through the movie. There are supernatural elements and Gudino isn't beyond one or two jump scares but they aren't central to the story or around every corner. Instead he relies on old tricks (suggesting more than showing, music and the old standby: pacing) to build tension. The Last Will isn't without a few hiccups. Though Poole is fantastic in the role of Leon, a daunting task considering this is essentially a one man show, I could never quite figure out why Leon left in the first place. There are hints that Rosalind wasn't a great mother and the state of her house suggests that the woman had a leaning towards the religious extreme but on his arrival, Leon seems surprised at state of the house which also suggests she wasn't like this when he left. It doesn't seem like big deal but knowing why he left would have made Leon more sympathetic because without it, it's not clear why he left, why he bothered to come back and why he stays even when things start to get strange. 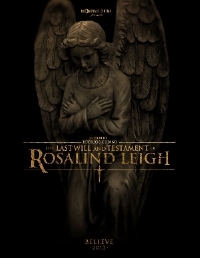 Even with the story issues, none of which detract from the enjoyment of the movie, The Last Will and Testament of Rosalind Leigh is a great watch, a haunted house thriller that succeeds in its scares and will stay with you long after the final credits roll. It doesn't hurt that the final voiceover will leave you itching to see the movie again.